This tract presents an offer to trust in the God who is content—the only source of true and lasting contentment. It’s something that all humans desire yet rarely find. But the fact that we’re searching for contentment isn’t unique or unusual. We were created to be content. C.S. Lewis wisely observed that the presence of an unsatisfied, unabated longing would seem to indicate that we were created to be satisfied by something from another world. And the key to experiencing this otherworldly contentment is learning where it comes from, why it is elusive, and how to get it. Any attempt to understand contentment must begin with God. As the only uncreated being, he is the only one who is not dependent on someone or something else. And as such, he alone is eligible to be the source of any true and lasting contentment. Imagine traveling back to the very beginning of time. Just to the left of the words “in the beginning” in Genesis 1:1, there is no creation yet—no earth and no people, animals, plants, or oceans to fill it. We see nothing. But that does not mean that nothing exists. We know from the Bible—even from the earliest words in Genesis—that God existed prior to creation and brought it about by his sovereign will (Genesis 1:1). God has neither beginning nor end and is unchanging, self-sufficient, overflowing in self-giving love, and unflinchingly committed to his own glory. To put it another way, we could say that God is and has forever been perfectly content in himself. Have you ever thought of God as being content? It is crucial for us, as we strive to learn contentment, that we see God in this light. The Bible portrays him as both the object and the model of contentment. He is content in himself, and he shows us that the only way to find contentment is in him. When God created, he did so not out of lack but out of abundance. It was the overflow of his love and a commitment to his glory that compelled God to create. The entire universe is a divinely constructed amphitheater to host the ongoing proclamation of God’s glory. 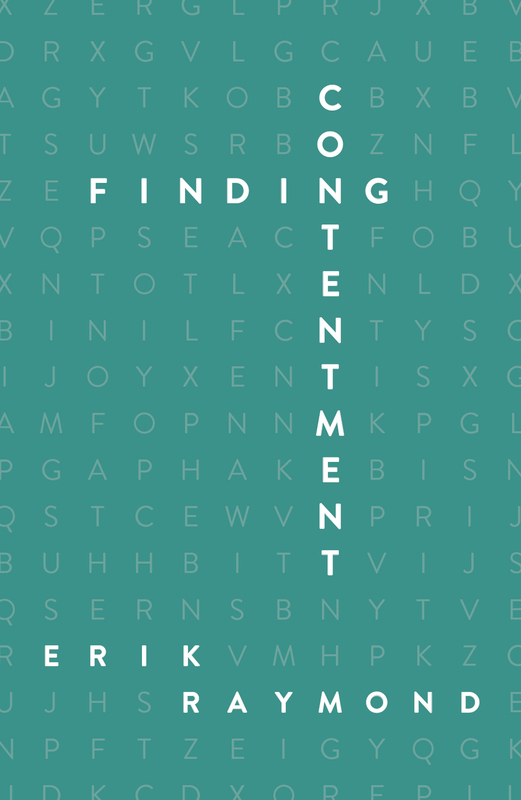 WHY IS CONTENTMENT SO ELUSIVE? But, of course, they sinned. And that first sin was a declaration. They appraised what God had given them and they wanted more. Like our first parents, we choose to pursue personal contentment in what God has made instead of in God himself. Ultimately this is what sin is. We rebel against God by loving his creation more than we love him. We elevate his good gifts to a place of deity while demoting God to the level of a common thing. We run back to the tree seeking after the magic potion to fill our souls, satisfy our desires, calm our consciences, heal our wounds, and make our lives count. It has never worked. At the beginning of the Bible, the sin that Adam and Eve committed in the garden of Eden was a sin of discontentment. And then in the rest of the Bible, you see God, in his work of redemption, bringing his creation back to himself. He’s bringing people like you and me back, through revelation of the Word of God and then, ultimately, Jesus coming and saving those who have placed their faith and trust in him for salvation from sin. He’s bringing us back to himself and is saying repeatedly to find our all in him, to be content in him. If, however, you believe you are too bad for God, then you must look again at the garden of Eden. God graciously, patiently, and lovingly pursued Adam and Eve with his words of hope and redemption. More than likely they still had the taste of sin in their mouths when they heard the promise of God in their ears. The fact that God pursues bruised reeds like this should deeply encourage us. He pursues us to lead us back to himself. Why? To make us content in him. Why should we be content in God? The answer is threefold: because this is what we were created to be, this is what Christ died to make us, and this is the privilege of those who are indwelt by God the Spirit. God’s design for us to be captivated and calibrated by his glory was once lost because of sin, but now has been won through the gospel. We become content by trusting in the God who is content. Heavenly Father, I believe you created me to be content in you and to bring glory to your name. I pray that you will lead me by your Holy Spirit to place my contentment in you and my faith and trust in the finished work of Jesus on the cross. Help me in a way that pleases and honors you. Amen.